Police identified 36-year-old Lance Antonio Way, of Silver Spring, Maryland, and 53-year-old Aubrey Wimbish Jr., of Southeast D.C., as the two people who were killed in the crash. It happened in the southbound lanes of Interstate 295 before Howard Road around 2:45 a.m. Friday. 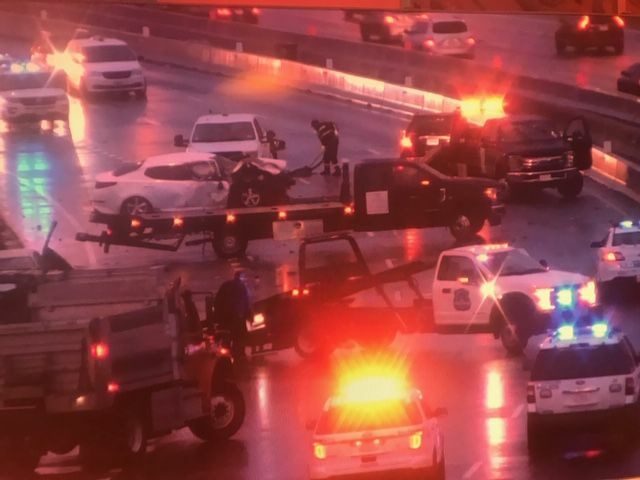 Police said that the driver of a Kia Optima was traveling northbound on the southbound lanes and struck a Mercedes Benz head on. The driver of the Kia then struck a Toyota Corolla. During these crashes, the driver of a Chevrolet Suburban tried to avoid the collisions by making an evasive maneuver. The driver of the Chevy lost control and crashed into a concrete barrier. The driver of the Chevy was pronounced dead on the scene. The driver of the Kia was taken to the hospital with life-threatening injuries and was later pronounced dead. The occupants of the Mercedes and the passenger in the Chevrolet were taken to the hospital with injuries that are not life-threatening, police said in a news release. The crash caused traffic diversions on I-295 for hours Friday morning. This accident is the third major accident in recent days to close a major highway in the D.C. area. A tractor trailer crash caused traffic troubles on the Beltway Thursday afternoon and a chain reaction crash also caused eastbound lanes of I-66 to close. Police ask anyone with information on the crash to call 202-727-9099.